Australia’s Aboriginal people have a continuous history spanning more than 50,000 years, one of the oldest living cultures on the planet. Theirs is the oldest story on Earth; a living legacy of spiritual knowledge, custodianship of land, culture, people and the connectedness of all things shared through rituals, art, dance, music, secret stories and journeys created in the Dreamtime – the time when ancestral spirits created the landforms and all life. The Australian landscape today is a map of the spirits’ journeys and stories created over thousands of years ago describing these journeys. These form the basis for stories that are still told. Aboriginal hosts and guides are keen to share their story and give an insight into their culture, which is often delivered with an engaging humour and deeply moving perspective. Many of the Luxury Lodges of Australia are located in parts of the Australian landscape of especial significance to our Aboriginal culture. Lodge activities can include exclusive or private access to some of these people, places, artworks and uniquely Australian stories. 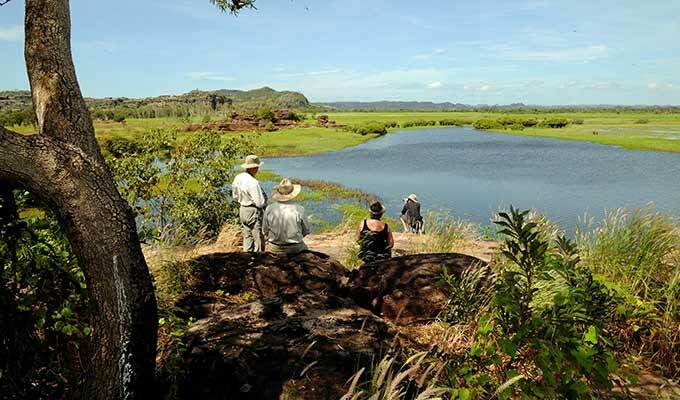 Beautiful billabongs, panoramic escarpments and ancient rock art galleries explained through the eyes of a local on this full day adventure to Arnhem Land by scenic air transfer from Bamurru Plains. Guests will experience a fascinating mixture of ancient and living culture in the small community of Gunbalanya. 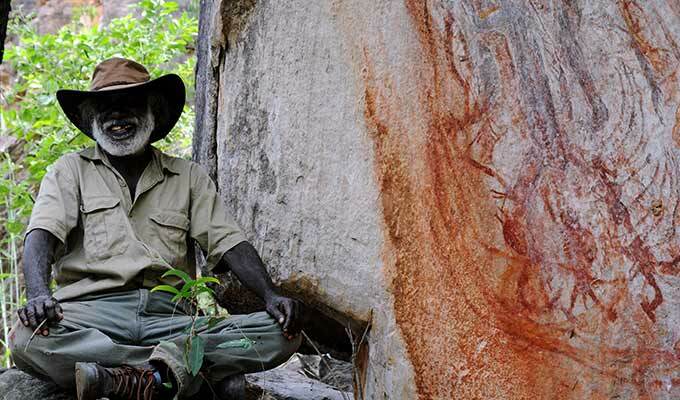 The day includes a visit to Injalak Hill, renowned for some of the best rock art examples in Western Arnhem Land. The view from the top of Injalak Hill is breathtaking looking out over floodplains, stone country and towering escarpments. 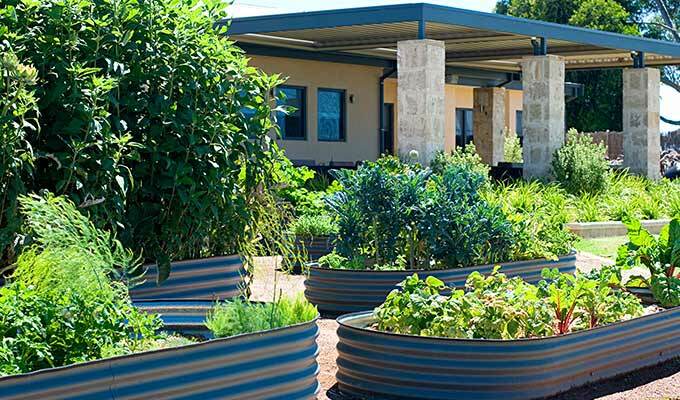 Visit the Aboriginal owned non-profit community Injalak Arts and Craft Centre to see artists at work in one of the oldest and continuous Aboriginal communities in Australia. See women weaving pandanus baskets and dilly bags, admire fine art paintings on bark and paper, carvings, limited edition prints and hand screen-printed fabric. The petite Capella Spa at Capella Lodge offers a chance to relax and recuperate with a menu of signature spa treatments using the LI’TYA spa care range, inspired by Australia’s aboriginal Dreamtime. Meaning ‘of the earth’, LI’TYA is a unique collection of healing rituals that integrate the revered, ancient aesthetics of the Australian earth and spirit. Massage options include the ‘Sacred Stone Therapy’, which draws upon the radiant power of warmed basalt stones gathered from the Lord Howe Island’s windward beaches. Created exclusively for the Capella Spa, the nurturing ‘Buruwang Dreaming’ treatment (which translates to ‘island dreaming’) is a complete head to toe enriching kelp exfoliation incorporating a nourishing hair mask, revitalising skin booster and aboriginal pressure points massage to body, head, hands and feet – designed to balance and align. The name Wolgan Valley is derived from the Aboriginal word, ‘wolga’, used for the vine commonly known as Old Man’s Beard, which is widespread throughout the region. It is thought that four nations frequented the region of Wolgan Valley, but of them it is the Wiradjuri and possibly the Dharug Aboriginal language group that were most likely the predominant groups. 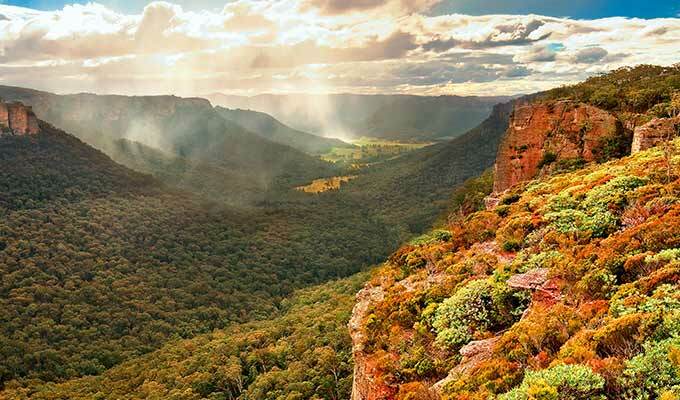 Many caves in the Wolgan Valley were used as dwellings and provide valuable archaeological evidence that dates back some 12,000 years including tools and wall murals painted on the stones. 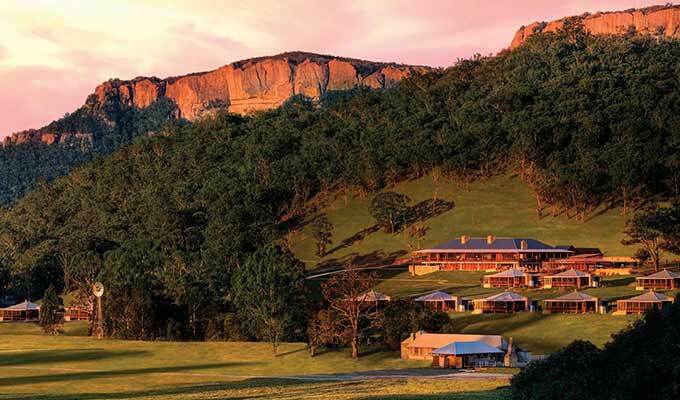 Aboriginal culture and its underlying respect for the environment is shared by many, so great efforts have been made to preserve and protect the natural environment at Emirates One&Only Wolgan Valley. Essential to the experience at Longitude 131° is connecting with the creative spirit of the land’s traditional custodians, the aboriginal Anangu. Since joining the Baillie Lodges collection in 2013, a new design direction at Longitude 131° has seen the introduction of local Aboriginal heritage. Owner Hayley Baillie has worked closely with the nearby Anangu communities to commission artworks for display at the iconic luxury outback retreat. 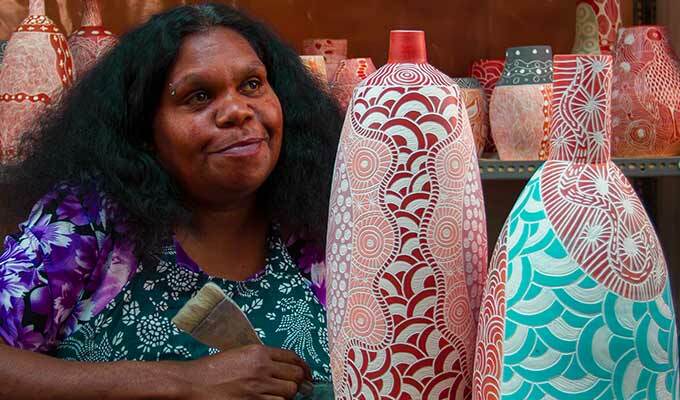 As a result, a rewarding relationship has developed with the Ernabella community of aboriginal artists in the Anangu Pitjantjatjara Yankunytjatjara Lands (APY Lands) in remote South Australia. Established in 1948 from its origins as a mission craft room, Ernabella Arts is the oldest aboriginal arts centre in Australia and has become a thriving art community that has ensured the preservation of aboriginal art heritage and culture over time. 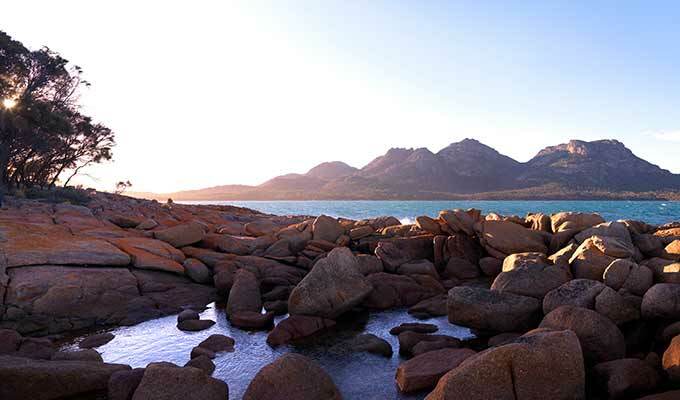 For the first time, a new bespoke experience offers guests at Longitude 131° an exclusive opportunity to visit the remote Ernabella Arts studio and engage with its residents. In turn, the full day private tour allows artists to share their heritage and artworks, creating a cultural connection that promises to be rich, colourful and unforgettable. Sara has a keen interest in the natural ingredients growing around the lodge and used over time in cooking by the Anangu people. She is a keen forager – often gathering succulents and berries and combines these very local ‘bush-tucker’ flavours with produce from Australia’s coastal and rural produce regions many kilometres away. Elemental to Sara’s food philosophy is working in harmony with the aboriginal seasons of the outback, through the ‘Kuli’ (the hot time), ‘Nyinnga’ (the cold time) and ‘Piriakutu’ (the windy in-between time), designing menus which both align with the desert environment and provide guests with refreshing sustenance. Sara considers the kitchen at Longitude 131° as the hub of contemporary Australian dining, bringing the nation’s finest flavours together on the plate. Pretty Beach House is located in the serene and quintessentially Australian bushland setting of the Bouddi National Park, just north of Sydney. The word ‘Bouddi’ is the local Aboriginal name for the eastern headland of Maitland Bay and has become synonymous with the national park and the surrounding area. It has various meanings in local Aboriginal languages, and is thought to mean ‘heart’ or ‘water breaking over rocks’. The Bouddi Peninsula is a very special landscape – around 100 Aboriginal sites have been recorded in the park and nearby areas. There is even aboriginal artwork dating back almost 10,000 years right on the doorstep to Pretty Beach House. A captivating ‘Welcome to Country’ Smoking Ceremony is performed by Aboriginal elders for every new guest at Pretty Beach House. 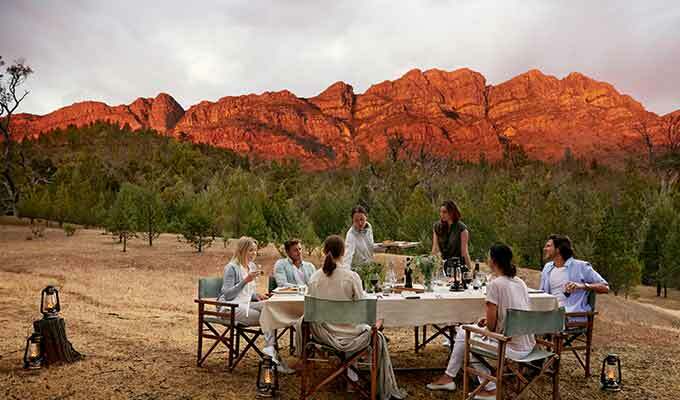 Guests watch, learn, listen to authentic Dreamtime stories told by Aboriginal Elders from the local Darkinjung tribe, as they share canapés and sip on Champagne around the fire. 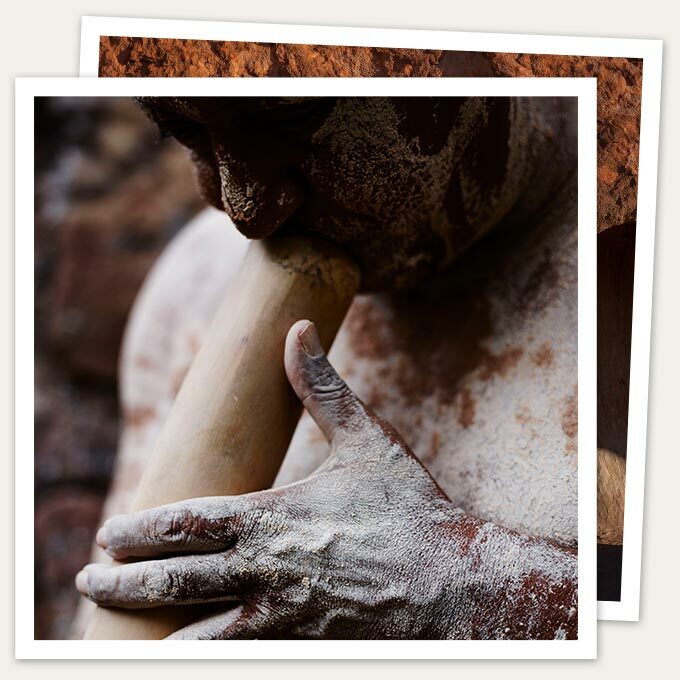 Ancient legends and tales are shared as guests listen to the moving sound of the didgeridoo allowing all to experience the culture, share their dreaming, immerse and connect with traditional Darkinjung country. The Bouddi Spa at Pretty Beach House is a haven for guests offering spa treatments that have been thoughtfully designed to rebalance the synergy between mind, body and soul. Pure Australian botanical products from the LI’TYA range are featured in the spa, offering a true spirit of place and connection to the earth. 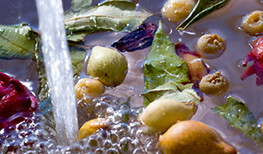 LI’TYA harnesses the earth’s elements to provide the finest spa treatments. Aboriginal culture recognises the significance of the elements in terms of their physical, emotional, spiritual and environmental aspects. The Bouddi Spa treatments aim to bring balance between these elements by combining a range of sensory therapies selected for their efficiency in purifying, nourishing and harmonising the body as a whole. 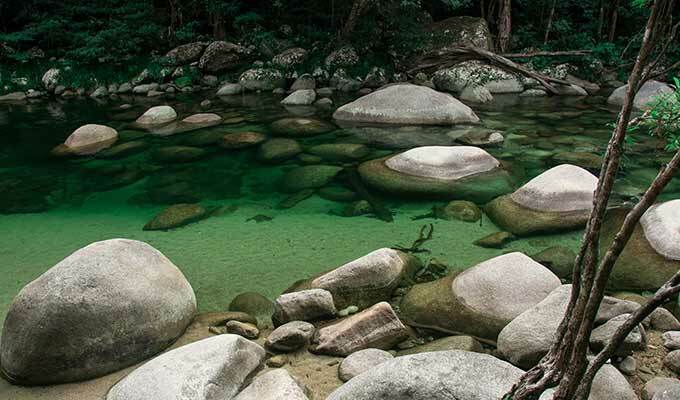 Silky Oaks Lodge has a strong affiliation with the Mossman Gorge Kuku Yalanji People who are the traditional owners of the Wet Tropics World Heritage Area. The Gorge Dreamtime Walk with the Yalanji People across the river from the Lodge in their Rainforest is a highlight activity for guests. 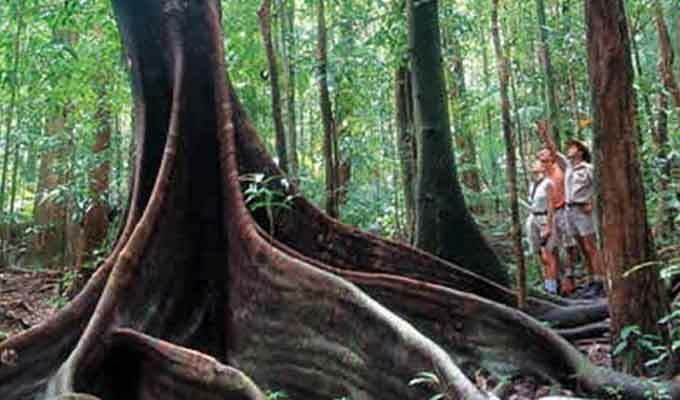 A tour with the aboriginal Walker brothers exploring the nearby beach mangroves and partaking in traditional hunting and gathering practices with the Yalanji people on their Cultural Habitat Walk is another popular guest experience. 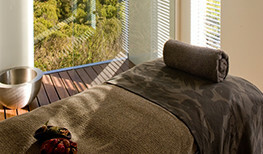 The acclaimed Southern Spa at Southern Ocean Lodge offers a signature menu of Dreamtime-inspired LI’TYA spa treatments, with Aboriginal massage techniques complemented by Kangaroo Island’s natural beauty ingredients: mineral salts, pink clay, eucalyptus, lavender and Ligurian honey. The Southern Spa is the first luxury spa in Australia to offer LI’TYA’s new Dihlbi Facial, combining new cellular technologies with traditional aboriginal botanical therapies to hydrate and renew delicate skin. Dihlbi translates as ‘early morning dew’ from the language of the aboriginal Bundjalung people of the NSW Northern Rivers. 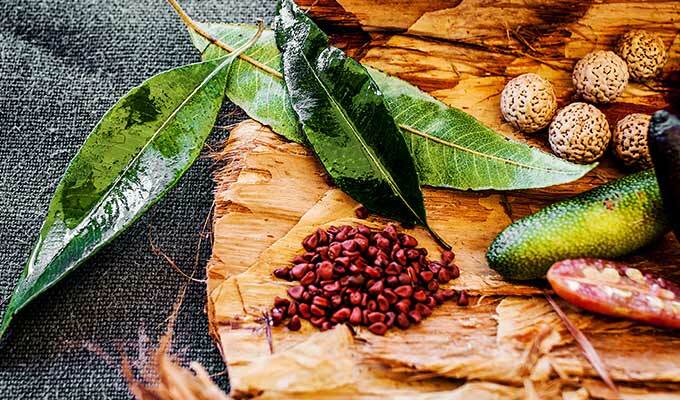 Native botanicals including the Banksia flower, Kakadu Plum and Native Fragonia are employed as active ingredients. The Southern Spa has partnered with premium skincare and spa treatment provider LI’TYA for therapies and treatments since opening. Meaning ‘of the earth’ the LI’TYA spa experience combines a range of sensory therapies that purify, nourish and harmonise the body using the profound wisdom of ancient Aboriginal medicines, spirituality and healing modalities. 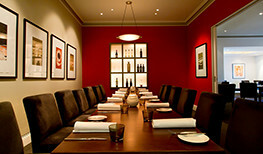 Dine while surrounded by Aboriginal art in the ‘Six Seasons Room’ at Appellation restaurant at The Louise. Guests seated in the dining space known as the Six Seasons Room are treated to an artistic immersion in the annual calendar as interpreted by aboriginal artist Shaun Pickett. According to the artist’s intention, the seasons of the year are segmented into six distinct weather patterns, corresponding to the different periods when food supplies can be sourced from the land. Artist Pickett’s communications of these weather events are presented as six colourful copper plate etchings, framed and hanging on the walls of this dining space. Appellation owners Jim and Helen Carreker selected this artwork to coincide with the six cycles that the restaurant experiences each year, when sourcing local fruits, vegetables, herbs and condiments for the kitchen’s commitment to serving ingredients that are only at the freshest part of their natural availability. 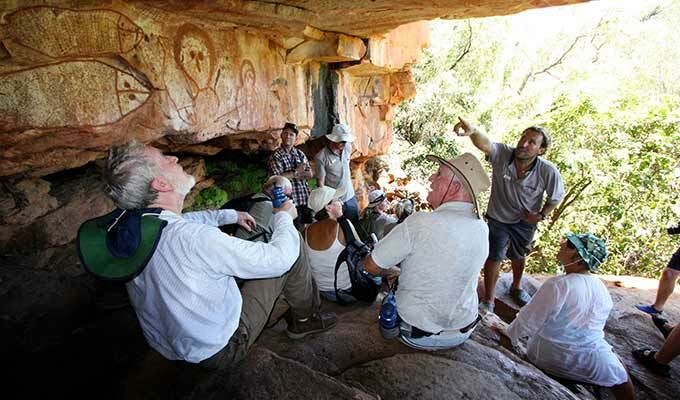 The TRUE NORTH’S Kimberley Wilderness Cruise is a ‘gallery’ to the oldest art known to mankind – the rock paintings of the Australian Aboriginal. 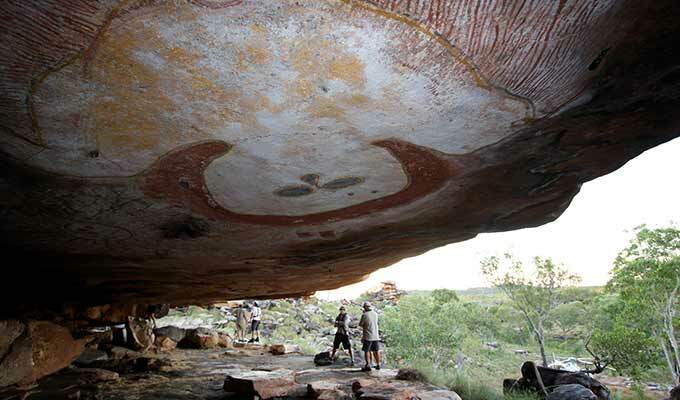 Each itinerary features opportunity to admire pristine examples of both Wandjina and Gwion Gwion style art. Wandjina art is characterised by spirit figures. In Aboriginal mythology the Wandjina were the cloud and rain spirits who created the landscape and its inhabitants. Gwion Gwion art is only found in the Kimberley and consists primarily of human figures ornamented with accessories such as tassels and headdress. Past research concerning this art has included debate about the origins and the ethnicity of the artists. Guests access ‘galleries’ either via guided walks or dedicated helicopter flights. The ship’s biologist/naturalists provide entertaining interpretive sessions. 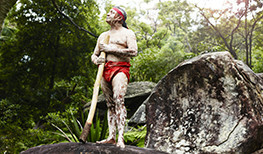 Some departures feature guest speakers with elevated knowledge of aboriginal culture. The Kimberley Wilderness Cruise is the TRUE NORTH’s flagship itinerary and is available in 7, 10 and 13 night variants.